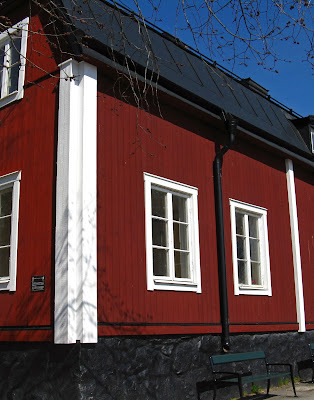 In my previous post, I wrote about the industrial environments from the 1700’s where thousands of lower-class Stockholmers worked, and now it is time to cover the environments in which they lived. While I find the few traces of 18th century manufacturing buildings and complexes interesting because of their long-lasting legacy of waterfront industry segueing to today’s most prominent planning projects, the individual buildings themselves are of limited architectural interest to me. However, I find the working-class neighborhoods from the same era fascinating and alluring. They have a certain old-timey enticement that is not watered down in effect but still rings true today. Walking through these areas, one feels a strong pull of sentimentality and it is easy to imagine how lovely life was in “a simpler time.” However, the 18th century reality of these working-class neighborhoods was extremely harsh and unpleasant. Disease was rampant and 4 out of 10 children died in their first year; the plague cycled repeatedly through the city killing one-third of the population in 1710 alone; and malaria, dysentery, jaundice, and tuberculosis were extremely common due to crowded conditions and stagnant, contaminated water. Stockholm competed with Paris throughout the 1700’s for the nastiest living conditions and highest death rates. Side-by-side with disease, hunger was also rampant. A factory worker working twelve hours per day six days a week did not earn enough money to feed him- or herself, much less an entire family. Food was perhaps the largest expense for a working-class family, and the extremely bad harvest years of 1705, 1708, 1717, and 1718 made food even more expensive. During the winter months, scurvy was extremely common among working-class families who generally could not even afford to buy onions. Today, these cozy cottages generally house a couple, rarely do they even house a family with children. In the 1700’s, however, conditions were extraordinarily crowded and statistics include one 130 square foot cottage which housed four adults and two children and another similarly sized cottage which housed two adults and eight children. Each lot generally contained a number of cottages in an unplanned jumble of survival at any cost, and records of one average-size lot of about 2,000 sq feet in the Katrina parish show that 99 people lived there. 99 people in 2,000 square feet! 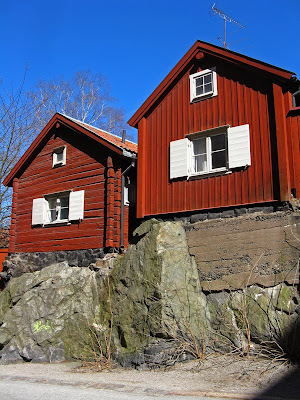 I have not read any statistics about the cold, but I cannot imagine that wintertime conditions in these drafty log cabins were warm and cozy, especially in a time before efficient wood stoves and in a time when significant deforestation around Stockholm was already a documented problem. Between the poverty, the disease, the hunger, the crowding, and the cold, I cannot imagine that any fragment of life in these neighborhoods was pleasant. Home life was hard, and working conditions for unskilled laborers weren’t much fun, either. A typical work day was twelve to fourteen hours, but a worker didn’t even earn enough to feed himself, much less house and clothe himself or a family. Because parents couldn’t support their families, working-class children began work at age five. A worker that complained about the bad working conditions or pay was threatened with the work house, where conditions were even worse. Due to low wages, sickness, and hopelessness, turnover in a factory was about 100% every year. 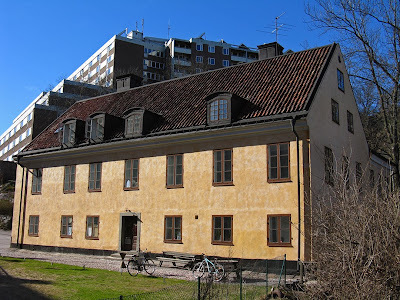 Labor in Stockholm was just starting to be organized into large factory environments during the 18th century, so there was quite a lot of variation to how the system functioned. Most commonly, a worker spun, wove, sewed, or ironed at home under a wholesaler who supplied many workers with work. This method was perhaps the cheapest way to produce textiles, but wholesalers despaired the slow work and small output. Simply put, home workers were distracted by home tasks such as cooking and caring for children, and there was no overseer to discipline the workers into producing more work at a faster rate. The next step up in organized labor was a small employer with eight or ten live-in workers who carried out one step of the fiber-to-clothing process (see #10 Öberg’s Clothing Factory). With this arrangement, workers were constantly under supervision and had fewer distractions. They cooked and slept in the same rooms where they wove or spun. The downside to this method was that it was more expensive, because the overseer had to provide food and housing, things that work-at-home wages didn’t cover. Less common were large industrial complexes with hundreds of workers who generally lived on the campus (see #1 Malongen spinning and weaving factory and #6 Barnängen Clothing Factory). There were also several forced-labor factories where the workers were prisoners, debtors, or orphaned children. The large complexes were even more efficient because all steps of the process were organized and carried out under one roof and because there were no middle-men. 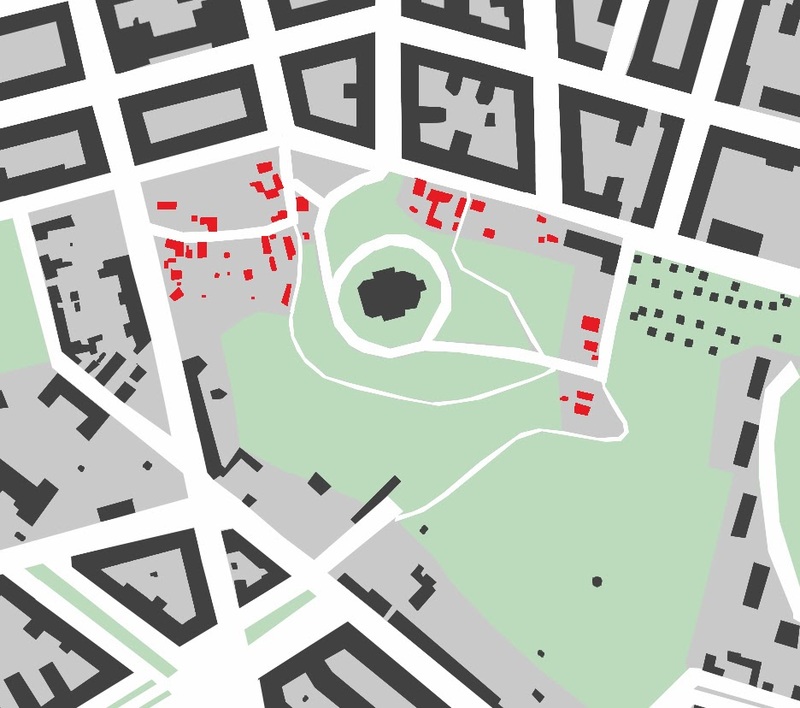 Large complexes became the preferred method, but there were few in Stockholm who had the capitol and political clout to carry out such ambitious plans. Despite the terrible working and living conditions suffered by the working-class, no one sympathized with their plight. It was coldly accepted that cheap labor was the cornerstone of profitable industry. The terrible conditions were further excused as employers claimed that higher wages would lead to laziness and licentiousness. Employers also complained that the workers were slow, drunken, and lazy and that they therefore didn’t deserve better payment. 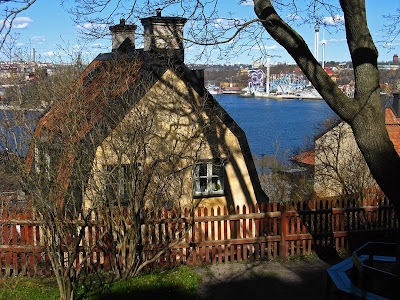 Previously, I have included a few areas of workers’ housing in my posts, notably in my post about the ship builders on Djurgården and workers’ housing in the areas of Södermalm dating back to medieval times. 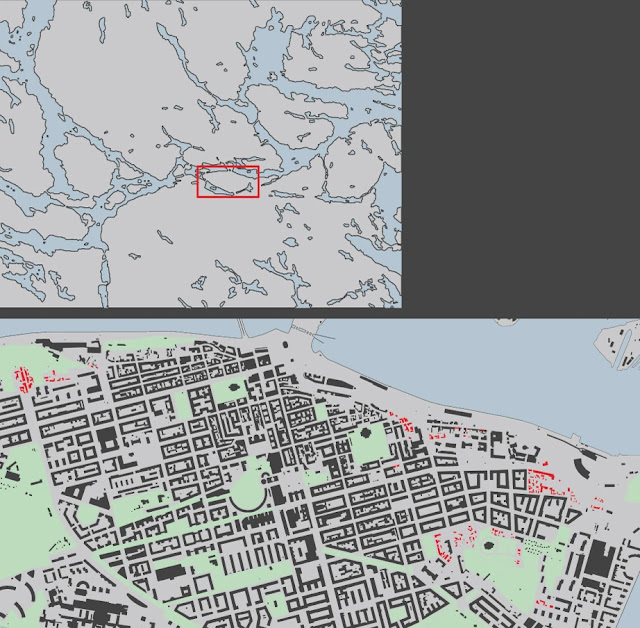 To my knowledge, other than the neighborhood on Djurgården, all of Stockholm’s surviving stock of 18th century lower-class neighborhoods are on the island of Södermalm, just to the south of Stockholm's Old Town Gamla Stan. 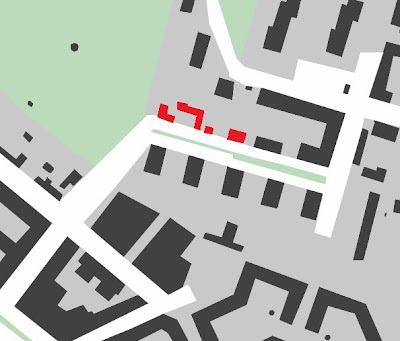 These workers’ cottages are entirely a case of the forgotten and left out. 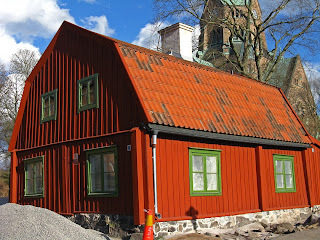 They were built on the edges of Stockholm’s settlement on Stockholm’s most undesirable island in areas that were disadvantageous due to undevelopable topography or and/or proximity to disagreeable vicinities of trash dumps and gallows. The residents did not own the land they built upon; instead they “claimed” the areas that no one else wanted. 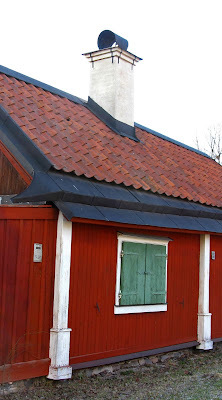 The cottages were built by the poorest of Stockholm’s poor with found materials and unsophisticated (if arduous) building techniques. Despite building regulations calling for stone and brick buildings, the majority of the shantytown buildings were built of timbers that the owners likely felled, milled, and transported themselves. The tiniest of one-room cabins were roughly square, but larger cottages housing more than one family were rectangular and were one log wide by two, three, or four logs long. 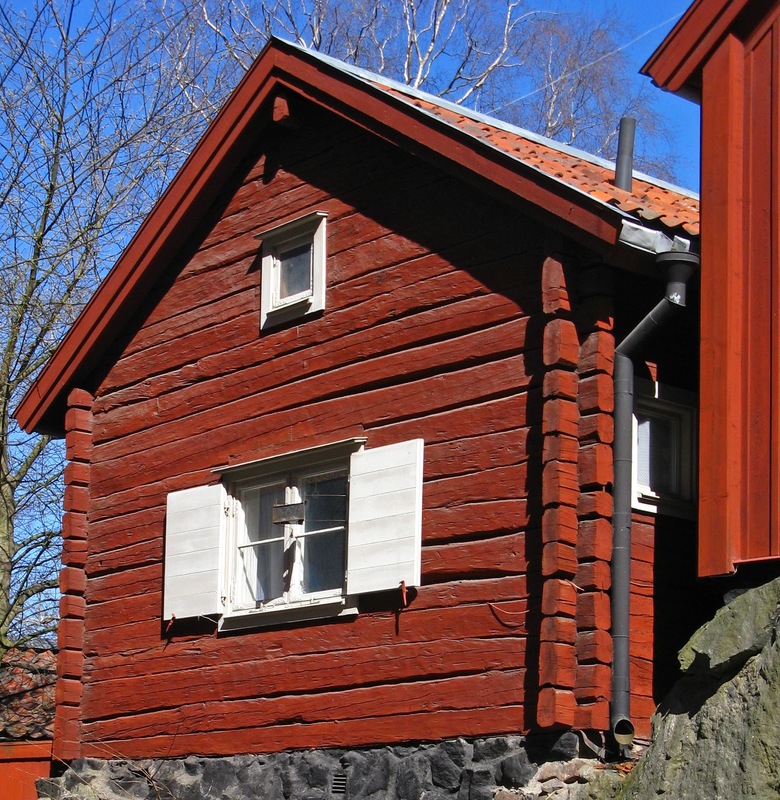 The timbers formed log-cabin buildings that were draughty, damp, and relatively dark. The buildings typically had earthen floors and were heated with rudimentary fireplaces which in some cases were later replaced with more efficient tile stoves. 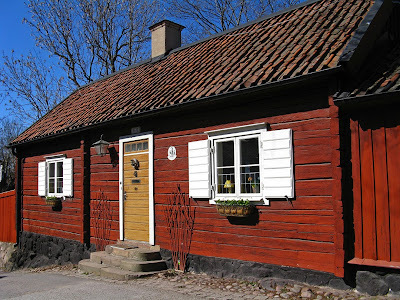 Unlike in Sweden’s more rural but slightly roomier cottages, much of the cooking took place in the yard—pleasant during the summer but brutal during the long, cold winters. The original turf roofs have since been replaced with terracotta tiles. Despite the simplicity of their vernacular architecture, some of the cottages show architectural ambitions. Over time, the log-cabin buildings were typically covered with boards and battens in order to keep draughts out and to keep the structural timbers dry from rot. 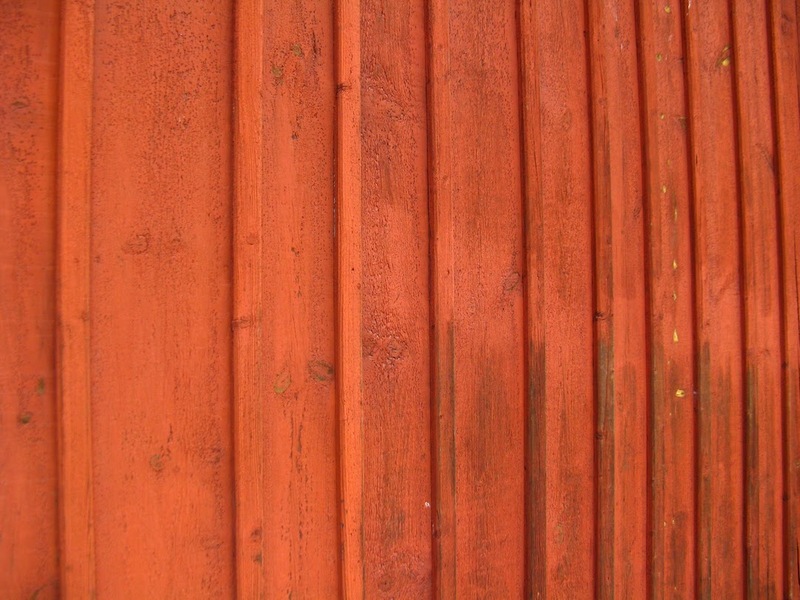 Typically, the boards and battens were made up of found or left-over materials, so they were not evenly sized or spaced, thus creating a fluid rhythm. Covering the main part of the building was easy, but the timber ends which jut past the walls were problematic. The simplest solution was to box in the jutting timbers; an L-shape box was necessary at the corners where the timbers from both directions jut out past the wall. Occasionally, the boxed timber-ends became the basis for an imposed classical architecture with expressed pilasters. Sometimes the expressed pilasters nearly became full-blown columns with bases and capitols. Occasionally, the timber houses have been covered over with plaster. Even with the plaster, covering up the timber ends is a problem, and they typically receive the same treatment with wood column-like boxes. Sometimes it is the gable-end of the houses which face the street; sometimes it is the house’s long side which lines the street. 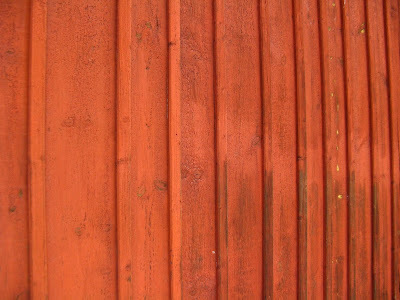 Between houses, a tall fence continues to define the street edge. Wagon-sized gates break the monotony of the fences. With buildings and fences creating a definite and uniform street edge, these neighborhoods are urban in character despite the simple, low rural architecture. I am 99.9% certain that there was no planning involved in the creation of these neighborhoods and that urbanity wasn’t a conscious intention. Instead, by pushing their buildings and fences up to the street’s edge, I believe that residents were trying to claim as much space as possible for themselves in the unbelievably crowded conditions. They were trying to keep in the chickens and children and were trying to keep the neighbors out of their vegetable patch. 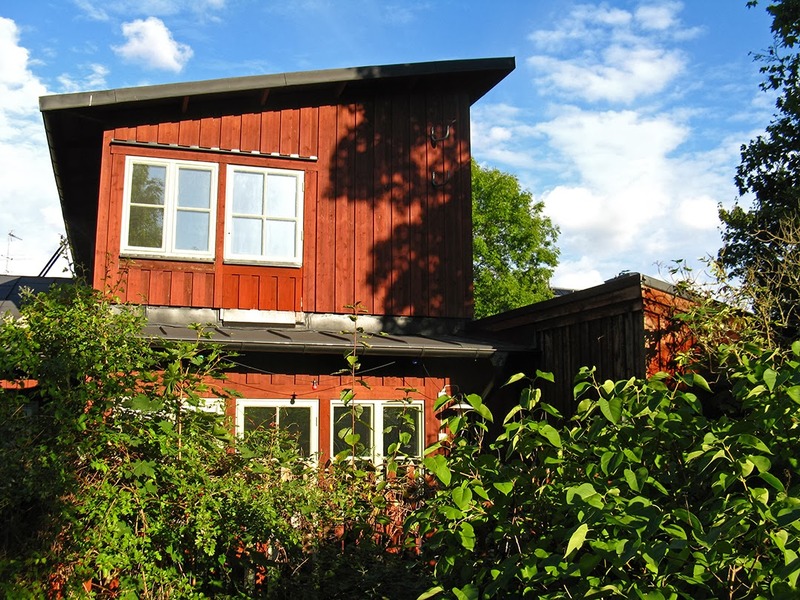 They were trying to create privacy in a world where 10 people lived in 150 square feet. By building their house tight against the street, residents gained a bigger yard in the back, but they also were able to see exactly what was happening out on the street without having to step outside. All of this makes me wonder: is our sense of what is urban with building-lined streets actually an expression of suburban poverty? Most of these neighborhoods were built in the mid 1700’s when Stockholm’s industry was booming and Stockholm’s streets were teeming with modest workers. They remained much the same through the early 1900’s when they were falling down in disrepair. Despite the disrepair, they were still teeming and overcrowded with Stockholm’s poor. Because they were shabby, old-fashioned, and unfashionable, these working-class neighborhoods were slated for demolition in the first half of the 20th century. I am so glad that the demolition plans were eventually reversed and that they were painstakingly restored and modernized in the 50’s and 60’s. Today, without exception, these buildings are highly prized and coveted rental apartments owned by the city. Stockholmers wait in the housing queue for 20 or 30 years before they are eligible to live in one of these tiny but atmospheric apartments. 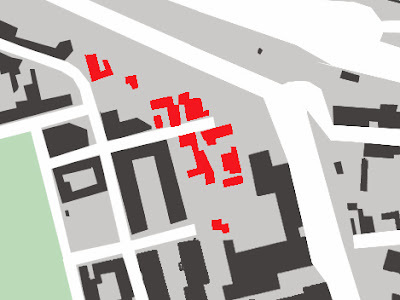 I am quite certain that the density of buildings in these area has been thinned out over time. 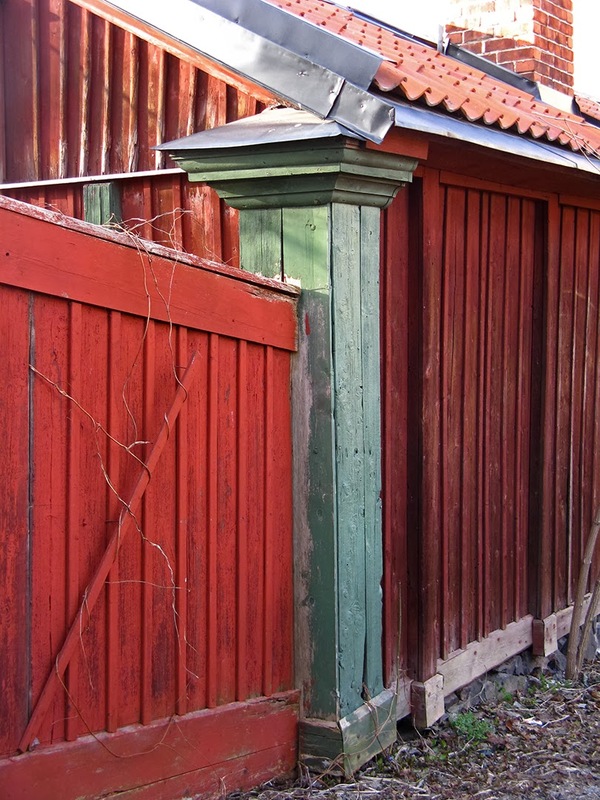 Today, each cottage has a lovely yard behind their fence, but my sources say that the yards were once crammed with additional make-do cottages, sheds, chicken houses, stalls, baking ovens, outhouses, etc. I also imagine that residents grew what vegetables they could in an effort to keep food costs down. 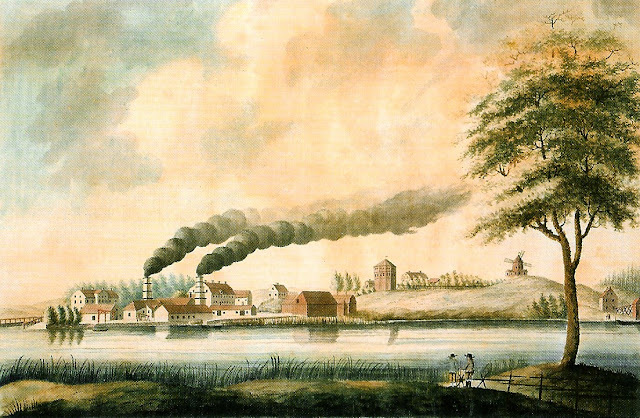 The idyllic, nearly rural landscape that we see today is a bit of revised history. Sofia Church sits high upon a granite knob which was never formally developed until the church was built in 1906. 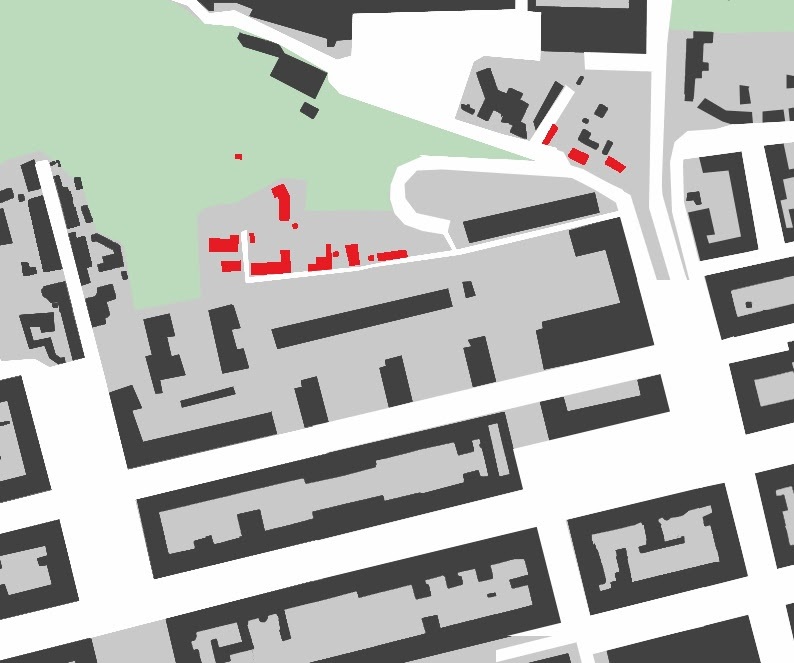 The knob’s steep edges discouraged formal development, and the “unclaimed” zones invited Stockholm’s poorest to build shantytowns. Even after the church and surrounding parkland were constructed at the beginning of the 20th century, the shantytowns were left alone because the underlying cliffs were just too hard to develop. Apartment buildings from the 1900's, 1930's, and 1950's just beyond the cliff's edge. 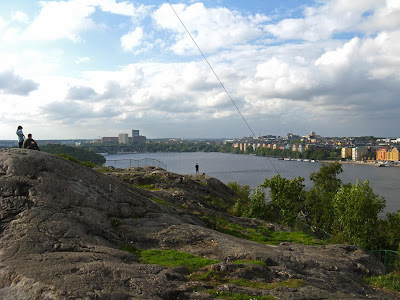 Eventually, the city of Stockholm bought the entire area, renovated it, and installed electricity. Today, the tiny cottages still have no running water and residents fetch water from a communal water pump and use outhouses in their backyards. The cottages are now highly coveted rental housing and artists studios. 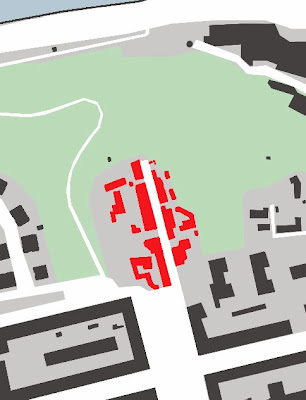 This historical pattern of forgotten tract turned shantytown slum turned highly coveted rental housing is typical of all of the areas I will be discussing below. These areas at the base of Sofia Church are tremendously charming and endearing today, but they historically were Stockholm’s ugliest, filthiest, most miserable slums. The typical resident was a shipyard or harbor worker with his family. Conditions were extraordinarily crowded: one 130 square foot cottage housed four adults and two children, while another similarly sized cottage housed two adults and eight children. The houses are generally pushed against the street with high fences completing the "wall." Just below Sofia Church’s precipices is Nytorget, or New Square. The shantytown around Sofia Church once extended all the way down to New Square, but road construction and apartment development in the 1930’s removed large tracts of the slum and divided it into two distinct areas. Although the square and surrounding buildings are charming and hip today, this was once an extremely undesirable part of town. Historically, the square featured the gallows, and it was also used as a trash dump. Wooden planks provided “bridging” across the festering square so that residents could get across to other parts of town. This area’s severe poverty continued until surprisingly recent times. During the food shortages of the winter of 1917, fourteen Nytorget residents starved to death in one day. while this plastered one is a modern interpretation of the older buildings and is meant to blend in or complement the context. From one side I think that the new building melds in quite well. However, from the other angle, it is too large and awkward, especially with the huge hanging balcony. 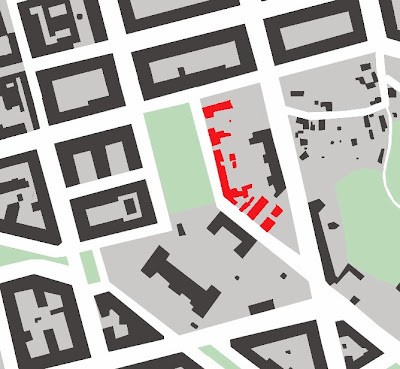 The exact history of this area is a little unclear to me—the buildings were either built as housing for Barnängen’s factory workers (see #6), or the buildings were originally factory buildings that were later turned into workers’ housing. What you see from the street. These buildings are on the back side of Sofia Church’s steep granite bulb, and the street is directly on axis with the Barnängen clothing factory. 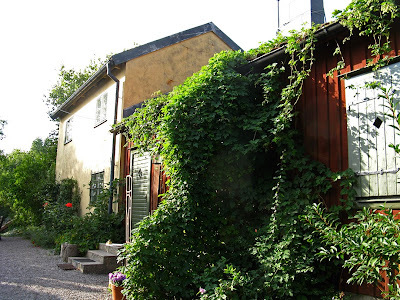 If you ask me, the area above Tegelvik is one of Stockholm’s coolest neighborhoods. 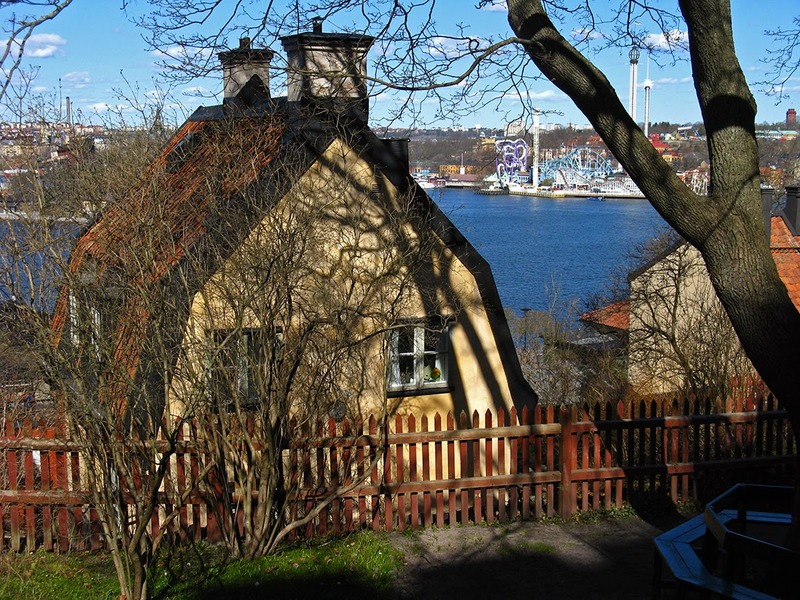 This neighborhood sits high, right on the edge of the cliff separating the island of Södermalm from Stockholm’s harbor. Like the neighborhoods above, this shantytown housed the poorest of the poor—shipyard workers, tar workers, seamen, tanners, silk weavers, clothing weavers, cotton weavers and tinkers and of course the workers’ families—in unbearably crowded conditions. 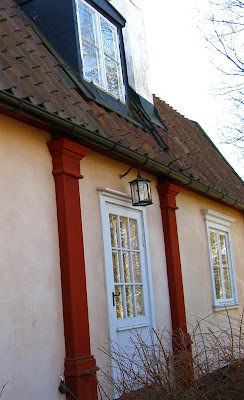 When the cottages were built in the mid-1700’s, this area was at the far outskirts of Stockholm (like all of the shantytowns I am covering in this post). By the early 1900’s, however, the area was attractively central and new streets with reasonable gradients were blasted in order to allow for extensive new development. At that point, the cottages were barely standing even though they were still heavily populated. It was the city’s intention to raze the shantytown, but somehow this never happened, and many cottages were left hanging above the new street level. It wasn’t until 1956 that Stockholm decided to keep and renovate the area. Most of the other shantytown areas I describe in this post consist of one stretch along one street. The visitor gets a sense of the architecture, but not a sense of how the overall neighborhood would have felt. 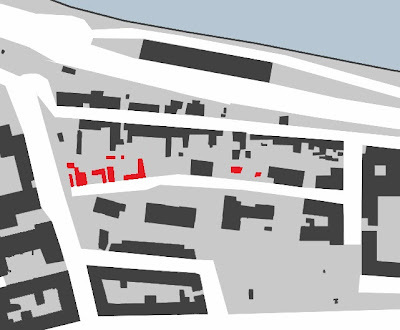 The neighborhood above Tegelvik, however, is much more extensive with several inner streets and paths. Wandering through the area, the visitor is completely encompassed by the 18th century shantytown and the sense of history is much more tangible. I do wonder, however, if the streets and paths were always so straight with right angle intersections? Surely they must have wandered over the topography? 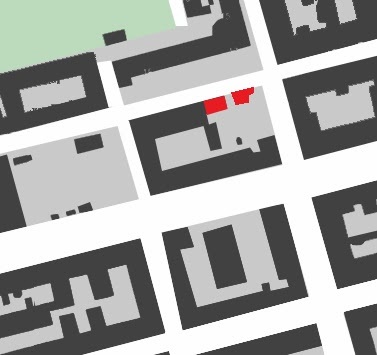 When the area was thinned out during the renovations in the 1950’s, I imagine that it was possible to redefine and straighten the streets into a more defined network. Weather or not the streets follow their original paths, the street names in the area are quite telling: Sågargatan, Kvastmakarbacken, Gruvbacken, and Skeppargatan describe their residents’ occupations: sawyers, broom-makers, miners, and seamen. Its pretty rare that the logs of a log cabin are exposed to the elements these days. However, this area boasts several "visibly log" log cabins. On the backside of the wealthier Fjällgatan (see #8 below) is the poorer Stigbergsgatan. Stigbergsgatan’s workers’ houses are an interesting contrast to the Fjällgatan houses where slightly more moneyed sea captains, skippers, and small shop owners lived. This street name does not describe the residents’ occupations, but it does depict the steep, cliff topography as it directly translates to “Climb Mountain Street.” The staircase from the water up to the gallows crossed “Climb Mountain Street” and this tainted the street's reputation. All of the above neighborhoods are on Södermalm’s eastern edge, but the final two areas are on the island’s northern side, far to the west of the previous neighborhoods. While Gamla Lundagatan and Yttersta Tvärgatan are several kilometers from the previous neighborhoods I wrote about above, all of the neighborhoods have many commonalities: these neighborhoods were once on the edges of Stockholm’s civilization, and they are on the edge of Södermalm’s cliff in areas with topography that is tough to heavily develop. They also housed Stockholm’s poorest in terrible conditions, and they were likewise purchased and renovated by the city in the 1960’s. These cottages are now desirable rental apartments. I would LOVE to live in one of these cottages. Or maybe in one of these with exuberant gardens. 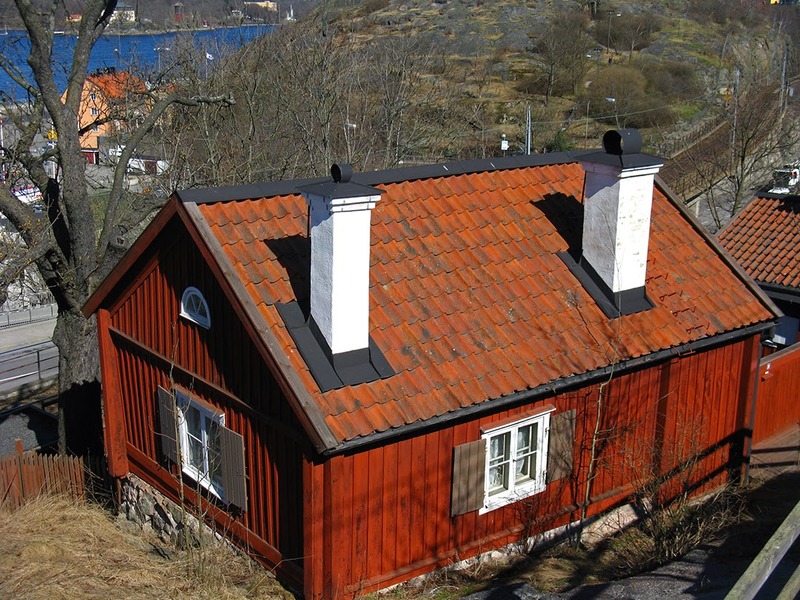 Skinners, tanners, tobacco farmhands, tobacco factory workers, spinners, ironers, and textile rollers were some of the working class people that lived along Gamla Lundagatan (“Old Grove Street”), which winds up to the top of Skinnarviksberget (“Skinner Bay Mountain”). The heights of Skinnarviksberget are still undeveloped and provide a fantastic view out over Stockholm and Riddarfjärden (“Knights’ Bay). Skinnarviksberget is also interesting because unlike Stockholm’s other high, craggy points (Vita bergen, Kronoberget, Vanadislunden), Skinnarviksberget was never made into a formal park and planted with trees. Its original windswept and treeless character remains. This neighborhood’s character is a bit different than all of the other neighborhoods I have described due to the larger stone buildings as well as the mixture of 18th and 19th century buildings. Although larger and more architecturally impressive, most of these large stone buildings actually housed the extremely poor. The city gave loans for landlords to build good quality housing for the city’s poor, and while I have not found many details, it appears that the housing was surprisingly well maintained over the centuries. More exuberantly wonderful gardens behind the houses. Yttersta Tvärgatan translates to “Outer Cross Street” and refers to the fact that this area was once at the very outer edge of Stockholm’s reaches. Outbuildings behind the main houses are now also attractive rental properties. 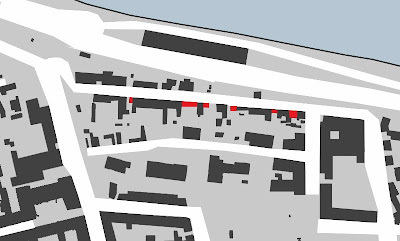 All of the above neighborhoods were crammed with the poorest of the poor. In contrast, here are several examples of contemporary neighborhoods whose residents were working-class but with good, steady employment. 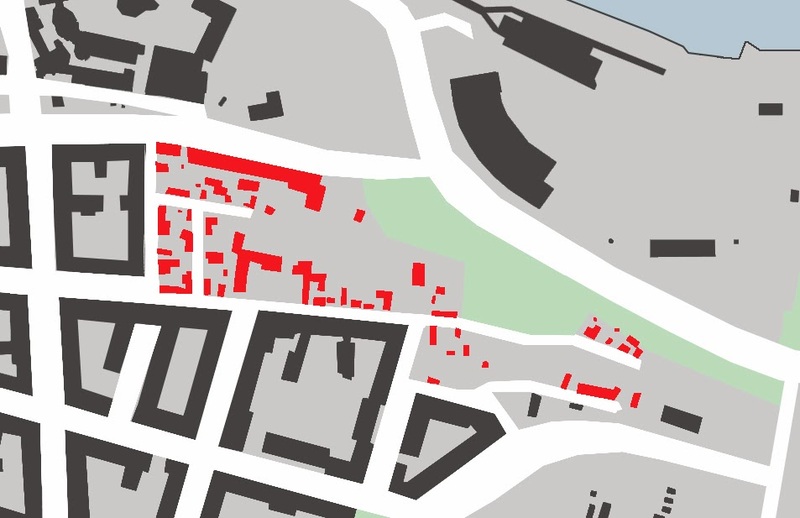 This isn’t a full survey of all of the slightly better-off 18th century neighborhoods in Stockholm; rather, these are a few examples that I happened upon during my wanderings. 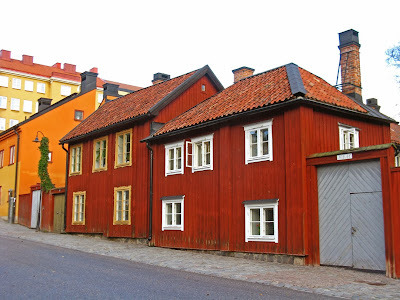 Although these houses are small compared to today’s standards, they were positively spacious compared to the houses which housed some of Stockholm’s poorest on Stigbergsgatan (see #5 above). The significantly more comfortable Fjällgatan residents included sea captains, skippers, and small shop owners. The word “fjäll” in the street’s name means “mountain,” also referring to the high, steep topography of the area. Before a path was blasted through Södermalm’s granite to make way for Renstiernasgata to slowly wind its way down to the water, Mäster Mikaels Street and Fjällgatan were one and the same. The houses on this street were built after the original houses burned down in the Katrina fire of 1723, and their replacements which are visible today were all finished by 1729. 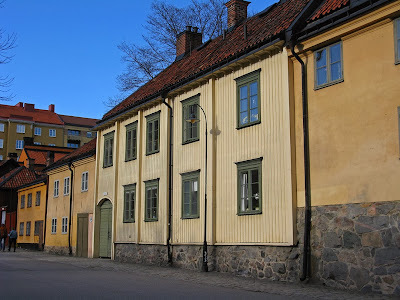 Initially, the houses along Mäster Mikael’s Street were occupied by steadily-employed types such as a navy skipper, a navy captain, and a court musician. However, by 1900, this street was noted as being one of the most crowded and slummy streets in Stockholm. The houses fell steadily into disrepair over time, but they were restored back to livable conditions in 1980. They are now coveted rental apartments. Interestingly, the street is named after the city executioner who lived on the street. He himself was executed after killing a man in a brawl. These two houses were built in 1727 and 1733 but their current appearance is from a renovation in 1841. From the looks of his house and the size of his lot, being a butcher was a rather cushy job. 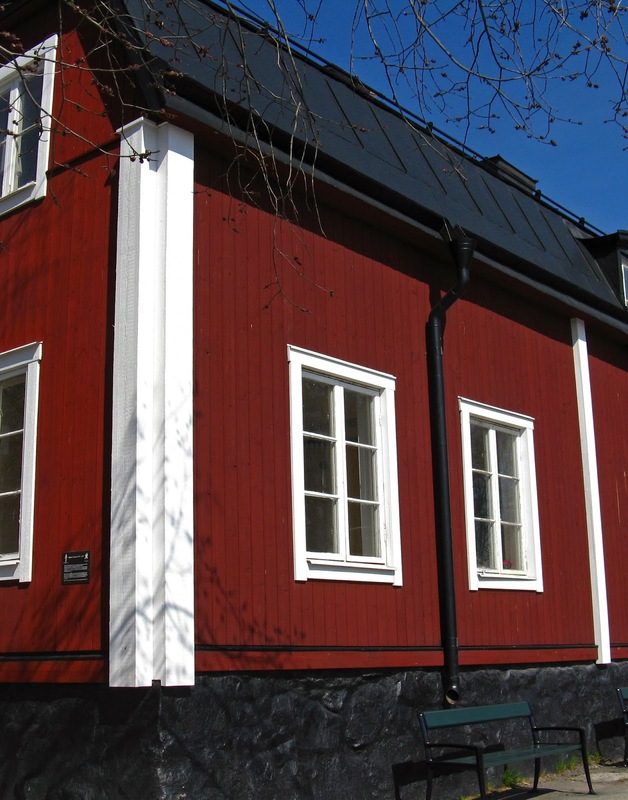 This is the only surviving building of Stockholm’s largest shipyard, Södra Varvet. The house was built in 1748, possibly by City Architect Johan Eberhard Carlberg, and was where the head of the shipyard lived. Calling this a “worker’s house” is a bit of a stretch since the master was more of an overseer and administrative person than someone who worked with his hands, but it does help to demonstrate the gap between how the poorest of the poor lived versus how the wealthy but non-nobility lived. J.F. Martin's painting from the 1790's of the Södra Varvet Shipyard. 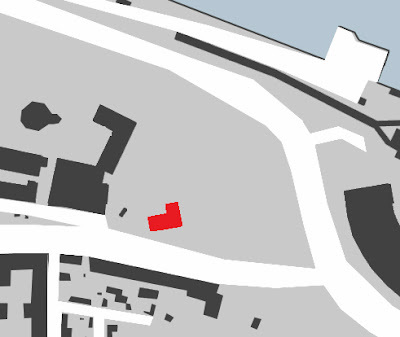 I added an arrow pointing to the Master's House. What is most amazing to me about these areas of workers’ housing is how successful they are in retaining their charm and their 18th century character without becoming cheesy tourist traps. While I have seen a few touristy types traipsing around, these neighborhoods are generally off the tourist radar and most of the people out and about actually live in the area. I believe that an important key to the authenticity of these neighborhoods is that real people actually live there, and that they haven’t been converted to old-timey shops or hotels. Another important key is that they were all renovated by a public authority, and that same public authority maintains the buildings and manages the tenants today. The city has more interest in preserving the historic character of the neighborhoods than in making money off of them; I have trouble imagining a private agency sharing the same altruistic goals. North is up in all maps.